New York—Four Olympians, a handful of international medalists, and one former event champion will headline a strong professional athlete field representing five countries at the UAE Healthy Kidney 10K in Central Park on Sunday, April 9. In the field chasing the $10,000 first-place prizes will be four athletes who competed at the United Airlines NYC Half on March 19 – Kenya’s Stephen Sambu, Ethiopia’s Teshome Mekonen, Mexico’s Juan Luis Barrios, and Puerto Rico’s Beverly Ramos – along with Kenya’s 2017 Aramco Houston Half-Marathon champion Veronicah Nyaruai. Sambu, 28, of Kenya, will go for his third NYRR event title, having already won the 2014 UAE Healthy Kidney 10K and 2016 United Airlines NYC Half. The University of Arizona product has made the podium in each of his three appearances at the UAE Healthy Kidney 10K, with his 2014 winning time of 27:39 being the second-fastest in event history. Sambu made his marathon debut at the 2016 Bank of America Chicago Marathon, placing fifth in 2:13:35. He finished fourth at this year’s United Airlines NYC Half in 1:00:55, his fastest time in the event to date. Nyaruai, 27, of Kenya, will make her UAE Healthy Kidney 10K debut after winning the Aramco Houston Half-Marathon this year in a time of 1:07:58, lowering her personal best by eight seconds. 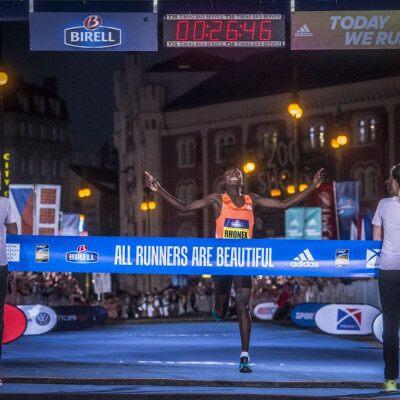 The former World Youth and World Junior champion, who represented Kenya at the Beijing 2008 Olympics when she was just 18, set a road 10K personal best of 31:41 last year en route to her third-place finish at the Copenhagen Half-Marathon. Teshome Mekonen, 21, of Ethiopia took third place at the 2016 UAE Healthy Kidney 10K and is coming off a third-place finish at the 2017 United Airlines NYC Half less than two weeks ago. Last year, he represented his country at the IAAF World Half-Marathon Championships, recording an 11th-place finish and helping Ethiopia to a team silver medal. Juan Luis Barrios, 33, of Mexico, is a two-time Olympian coming off a ninth-place finish at the United Airlines NYC Half. He’s a two-time defending Pan American Games champion over 5000 meters and has run both his indoor and outdoor personal bests in the distance in New York City. Sam Chelanga, 32, of Colorado Springs, CO, was the top American finisher (11th) at the IAAF World Cross Country Championships in Uganda last weekend and will be making his UAE Healthy Kidney 10K debut. The 2015 USATF Running Circuit champion was born in Kenya and became a U.S. citizen two years ago. Beverly Ramos, 29, of Puerto Rico, broke her own Puerto Rican record at the 2016 NYRR New York Mini 10K, running 33:17 for seventh place. Her 2015 TCS New York City Marathon time of 2:41:56 was faster than her national record by more than three minutes and qualified her for the Rio 2016 Olympics. Mamitu Daksa, 33, of Ethiopia, is a two-time Frankfurt Marathon champion who has had tremendous success in New York. In addition to winning the 2013 NYRR New York Mini 10K, she recorded runner-up finishes at the 2009 NYC Half, 2014 UAE Healthy Kidney 10K and 2014 NYRR New York Mini 10K. The UAE Healthy Kidney 10K will begin at 9:00 a.m. on Sunday, April 9 on East Drive near 69th Street and will loop through Central Park before finishing at the 72nd Street Transverse. In addition to the men’s and women’s $10,000 first-place prizes, runners will vie for a $30,000 Zayed Bonus awarded by the Embassy of the United Arab Emirates in honor of former UAE president Sheikh Zayed Bin Sultan Al-Nahyan. The bonus prize will be given to any man who breaks 27:35 (Leonard Patrick Komon, 2011 UAE Healthy Kidney 10K) and/or any woman who breaks 30:44 (Lornah Kiplagat, 2002 New York Mini 10K). The United Arab Emirates is the primary sponsor of the race, which benefits the National Kidney Foundation, Inc., in appreciation of American doctors and U.S. excellence in the kidney transplant arena. UAE’s founder and first president, Sheikh Zayed Bin Sultan Al Nahyan, benefited from U.S. expertise, knowledge, and research when he received a kidney transplant in 2000. Among his many honors and accomplishments, he was most proud of being a kidney transplant survivor. Every year, the UAE Healthy Kidney 10K raises awareness of kidney disease and organ donation, and promotes kidney health by supporting the National Kidney Foundation and its lifesaving programs. Runners can register for the race with NFK’s Team Kidney and raise additional funds in support of the organization’s mission. Tags: Stephen Sambu, 10k, NYRR, Sam Chalenga, Mamitu Daska, Thomas Longosiwa, Veronicah Nyaruai.